There are lots of ways to increase your company’s value. You can grow sales. You can pay down debt. You can implement job shop software to make your shop more efficient. You can even upgrade your machinery and facility. However, one of the best ways to grow your bottom line and increase the value of your shop is through an asset that doesn’t even appear on the balance sheet. your shop. If you take care of them and help them work at optimal performance, you’ll likely see your shop thrive. If you neglect them, you’ll probably have some tough times ahead. One of the best things you can do for your employees is to give them the knowledge and skills to expand their work and responsibilities. Train them on how to do better at their job and possibly even on how they can move up and fill other roles. By investing in training and education for your employees, you can increase your shop’s efficiency, productivity, and profitability. It prevents turnover in your job shop. Tried looking for a skilled, experienced machinist lately? It’s no fun, is it? Having an empty position can be devastating for most shops, especially those that work on quick turnaround times for their customers. Employee training helps in two ways. First, it makes your employees feel better about their jobs, which reduces the chances of them looking for work elsewhere. Workers tend to be more satisfied when they see that you’re committed to them and their future. Second, training gives you a ready-made roster that you can use to fill in those empty slots. Maybe you have a younger machinist who can step up and fill the open position because of all of the training he’s received. It’s always easier to fill a role internally than externally. It improves your shop processes. One of the secondary benefits of training is that it gives you an opportunity to really evaluate your process. After all, you have to design the training. That time spent creating training material will also be spent analyzing your process. You may discover inefficiencies that you never noticed before. You can have the best documentation job shop software on the planet. However, if your employees aren’t trained to identify inefficiencies, you’ll have a hard time strengthening your process. Also, you newly trained employees will be better armed to spot inefficiencies and suggest improvements. They’re the ones doing the work on a daily basis. Who better to suggest improvements than them? First, though, you have to arm them with knowledge. Training frees up your time to focus on growing the business. Shop owners often say that they don’t have time to develop a training program. That mindset misses the bigger picture. Training does take some time upfront, but you’ll more than recoup that lost time over the long run. The reason you’ll save time is because your employees will be able to handle bigger responsibilities without your assistance. That programming issue that keeps popping up? Now you’re trained shop supervisor can handle it. Problems documenting notes in the ERP system? Your employees are trained to do that. You won’t be needed to address every little issue that pops up. That means you’ll have more free time to focus on important things, like growing the business or actually making it home in time for family dinner. Implement a formal, scheduled program. Decide what the most important topics are and schedule them out over a three month or six month period. You can do one session every week. You may want to put all the employees through it in the beginning and then have it available for new employees after that. You also may want to have your experienced employees teach some of the sessions. That will help them brush up on the material, plus it will give them some added responsibility and leadership within the shop. Help your employees grow along with your shop. Chances are good that many of your employees have career ambitions beyond their current role. Of course, you probably also have a few employees who are happy to do their current job forever. Take the time to have a conversation with each of your employees to understand which camp they fall into. If you have someone that wants more responsibility or wants to learn a new skill, design a plan to help them reach that goal. Your next engineer or senior machinist may be out there right now sweeping your floor. However, if you don’t take the time to help them reach their goals, they may end up at one of your competitor’s shops. Your vendors are a great source of training material. Here at Shoptech, we have consultants available to come out and lead an in-person ERP training session with your employees. 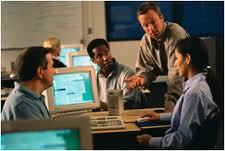 We also offer online virtual trainings and live training in our offices. It’s likely that your other vendors offer similar programs. Lean on your vendors for help. They’re the experts on their specific product. Who better to lead those training sessions than a company representative? If you don’t have a formal training program in place, it’s never too late to start. You may want to begin by informally surveying your employees. Find out what they want to learn about and how you can help them grow. You’ll likely find them more receptive to the idea than you’d expect. Contact us for more information on how we can help you invest in your employees. We would welcome the opportunity to help you train your team and strengthen your shop.